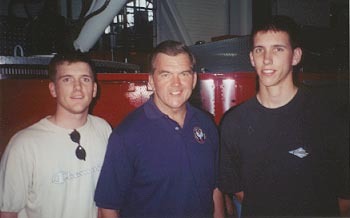 Representatives of East End met with Pennsylvania Governor Tom Ridge to discuss the state of the fire service. Governor Ridge was very impressed with East End's dedicated volunteers and vowed to support them in any way that he could. 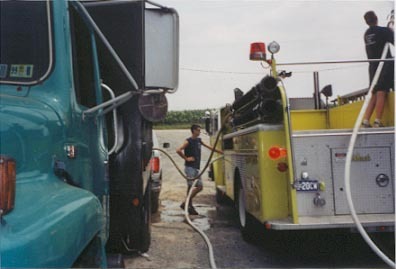 In July of 1999, as the mercury soared above 100 degrees, East End was called upon to provide service to Yost Farms of Stewartstown, PA. By spraying water on the roof of the chicken houses, East End's firemen were able to cool the inside temperature for the nearly 60,000 chickens. While still in service with Rawlinsville, Engine 5-8-3 transferred to Fawn Grove Station 56 during a 3-alarm Amish barn fire. This incident occurred in 1995 and when looked back upon, seems to be a bit ironic. 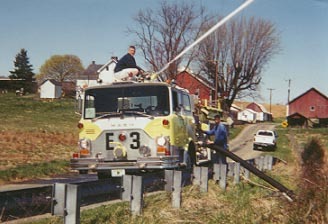 These days, Engine 3 can often be found flowing water at the McDermott Road draft site. 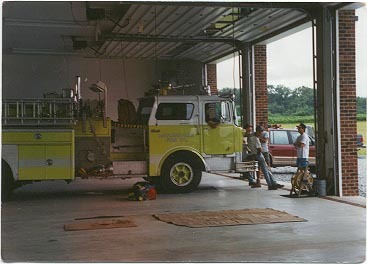 Tested annually, the Mack still flows 1250 gpms through its roof mounted deck pipe.